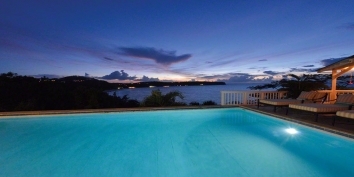 This luxury Bahamas villa rental has 3 bedrooms, each with private bathroom, an infinity-edge swimming pool, beautiful ocean views! 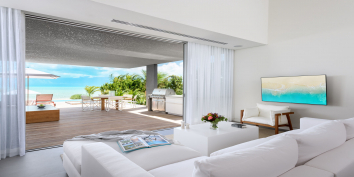 Waterside Escapes, West End, Grand Bahama, Bahamas, provides exclusive privacy and luxury living for your vacation. 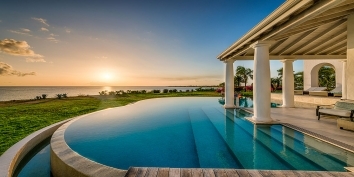 This luxury Bahamas villa rental has 3 bedrooms, each with private bathroom, an infinity-edge swimming pool, beautiful ocean views and accommodates 6 guests in elegant comfort. Waterside Escapes includes a main house with living room, dining room, kitchen and master bedroom, two oceanfront guest suites are detached from the main house to offer additional privacy, an infinity pool with beautiful ocean views, a private dock and access to the local private airport. 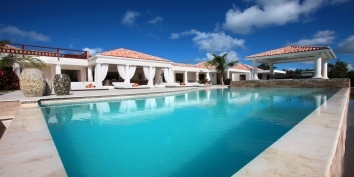 This Bahamas villa rentals comfortably sleeps 6 and can host 14 to 100 guests, offering the ideal destination for a secluded wedding, family reunion or corporate retreat. Waterside Escapes is set on 146 feet of oceanfront and more than 150 feet of private deep-water canal footage with a private dock. Enjoy the peace and tranquility of a holiday villa on an island that includes everything you want in a tropical paradise! Waterside Escapes is located on a quiet island, just a couple of feet away from the ocean, and is only a 2 minute drive to Old Bahama Bay Resort, 5 minutes to West End Village and 35 minutes to Freeport. Waterside Escapes has an elegant and spacious living room and a dining room with a beautiful mahogany table that comfortably seats 12. The family room provides a quiet sitting area with ocean view and a large flat screen TV with cable. Waterside Escapes has 3 beautiful bedrooms with expansive views of the ocean and breathtaking sunsets and each includes a private bathroom, flat screen TV, cable, wireless Internet access, and air conditioning. The Master Bedroom comes with king size bed, flat screen TV and a private bathroom with tub and shower and luxury bath amenities. The guest cottages each have king beds, private bathrooms, flat screen TVs and double doors which open right on the ocean’s edge. Stay 7 nights and get the 7TH NIGHT FREE! ONLY $9,300 per week! Stay 7 nights and get the 7TH NIGHT FREE! ONLY $8,100 per week! $10,850 per week. 5 nights minimum stay. The above rates are subject to an additional 10% tax. The rates include daily car rental. Private dock for vessels up to 100'. Docking fee is $1.50 per ft, per night, utilities included. All year long your 7th night is FREE (with the exception of Christmas, New Year and other holidays). 2 nights minimum stay, except holidays where 3 nights minimum are required and Christmas/New Year where 5 nights minimum are required. Housekeeping provided once weekly. Exit clean $150. Additional days at $100 per visit. Private chef services available. Pricing on request. Grocery pre-stocking offered for $75 plus cost of groceries. Cancellation Policy: Payment will be forfeited if reservation is cancelled within 48 hours of scheduled arrival and for no-shows, but can be used towards a future stay within 6 months of original arrival date. Payment Terms: Full pre-payment required to confirm reservation. If reservations are made more than 2 months in advance a 50% deposit is required with remainder due 60 days out. Google Map showing the approximate location of Waterside Escapes, Grand Bahama, Bahamas.